For patients who suffer from dental phobia, anxiety, prior dental trauma, extremely sensitive teeth, a strong gag reflex or sensitivity to local anesthesia, sedation dentistry is a useful tool. We will cover the top three medications prescribed at Desert Breeze Dental to ease your dental phobia for upcoming visits and procedures. There are a variety of oral medications with a sedative effect that can be used to assuage anxiety and make you feel more comfortable in the dentist’s chair. Some medicines can help you fall asleep during dental procedures and reduce or eliminate your memory of the sights, sounds and smells of the dental office. Sedation dentistry can allow dental procedures to be completed in fewer appointments, and some complex and lengthy dental procedures may take less time when a patient is sedated. Halcion (Triazolam) is commonly used as a sedative in conjunction with local anesthesia during dental procedures, and may also be used to reduce anxiety during other types of dental appointments. Halcion acts quickly once it is taken, and its sedative effects last for seven to eight hours. It is very effective for extensive dental procedures that take a lot of time and has a short elimination half-life. Xanax (Alprazolam) is a potent, fast -acting benzodiazepine that is often prescribed for the treatment of anxiety disorders. Its effects last for four hours, and it has a short elimination half-life. Ambien (Zolpidem) is effective in initiating sleep before and during dental procedures. It has a rapid onset of action, a short elimination half-life and its sedative effects last for eight hours. Patients often don’t remember much about their appointment after the procedure is completed. Each person reacts differently to medication. Your dentist will discuss sedation options with you and help determine which medicine best fits your needs. He or she will give you a prescription prior to your appointment. To get a good night’s rest you may take the medicine the night before, and will take it again one hour before your dental appointment. Keep in mind that if you opt for sedation dentistry you must have someone else drive you to and from your appointments. Many patients who suffer from dental phobia or anxiety put off going to the dentist for years, which can lead to painful and costly dental problems that must be treated eventually. 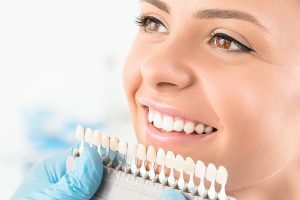 Sedation dentistry can help calm your fears and make dental treatment a more comfortable experience, allowing you to get the vital care you need. If you would like to learn more about how Desert Breeze Dental can make dental treatment a safe, comfortable and stress-free experience with sedation dentistry in Las Vegas, please contact us at 702-869-0032 to schedule an appointment today! Our compassionate and experienced dental team looks forward to serving all of your dental care needs. TMJ disorders are caused by a number of factors, and can lead to conditions such as headaches, pain and stiffness in the jaw, and difficulty opening or closing the mouth. 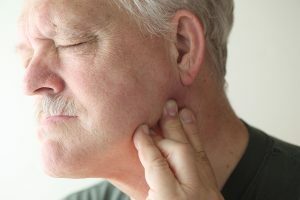 If you are looking for a dentist in Las Vegas to help treat your TMJ disorder, there are a few things you should know before you go. The temporomandibular joints (TMJ) on each side of your head connect your jawbone to your skull. They act as hinges when you open and close your mouth, eat, speak and swallow. In addition, these joints, muscles, bones and ligaments control the lower jaw as it moves side-to-side, forward and backward. The bones that work together within the joints are coated with cartilage and separated by a disc that sits between the ball and socket. This disc cushions the joint and allows for smooth movement of the jaw. Anything that impedes the complex elements of the joint from working in-sync can lead to a painful TMJ disorder known as TMD. Diagnosis is an important step in determining the most effective treatment for TMJ disorder. Your dentist in Las Vegas will palpate joints and muscles to identify areas of tenderness, listen for clicking and popping when you open and close your mouth, and observe the range of motion in your jaw. Some types of X-rays can also help your dentist determine whether you are suffering from a TMJ disorder. Our compassionate and professional dentist in Las Vegas can help you find solutions for your TMJ disorder. Our experienced dental team is dedicated to providing comfortable, top-quality dentistry for all of our patients. For more information or to schedule an appointment, please contact Desert Breeze Dental at 702-869-0032 today! We look forward to taking care of all of your dental care needs. Many people with damaged or missing teeth stop smiling because they are self-conscious about the way their teeth look. When they make the decision to enhance their smiles with the help of a Las Vegas cosmetic dentist, many are surprised to learn that it can be life-changing. Porcelain Veneers – Dental veneers are custom tooth-colored porcelain restorations that are bonded to the front of the teeth. They are natural-looking and enhance your smile by covering imperfections such as fractures, cracks, stains and gaps. Tooth Bonding – Typically used to improve the appearance of decayed, discolored or fractured teeth, bonding is one of the least invasive and most affordable ways to improve your smile. Laser Teeth Whitening – One of the most popular cosmetic dental procedures, whitening is an affordable, convenient and non-invasive way to effectively whiten and brighten your smile. 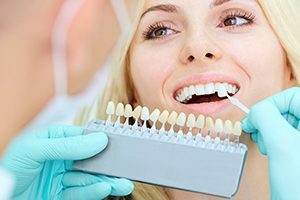 White Composite Fillings – These metal-free tooth-colored fillings are strong and durable, and create natural-looking restorations that blend with your own tooth. Ceramic Crowns – Strong porcelain crowns are often the most aesthetically pleasing option when it comes to protecting teeth that have been compromised by decay or large fractures. 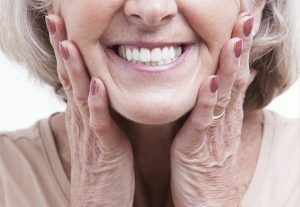 Dental Implants – If you are missing teeth, implants can fill that individual space in your smile. These wonders of modern dentistry look, feel and function like real teeth. Our dentists will thoroughly examine your teeth, assess your oral health and discuss the problems you’d like to address, such as repairing misalgined, fractured or discolored teeth. Replacing missing teeth and fixing any other dental imperfections that you may have. They will then craft a customized treatment plan to fit your individual needs and help you receive your desired results. Dr. Paul VreNon is the only Las Vegas cosmetic dentist accredited by the American Academy of Cosmetic Dentistry. Our compassionate and professional dental team is dedicated to providing the best in comfortable, modern cosmetic dentistry. If you are ready to improve your smile and your life with cosmetic dentistry, contact Desert Breeze Dental at 702-869-0032 to schedule an appointment today! 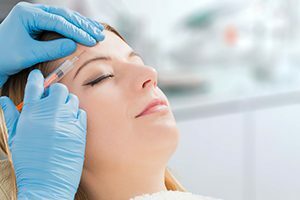 When someone expresses an interest in getting a Botox treatment, others often assume that it’s to get rid of fine lines and wrinkles around the face. This is a fair assumption since this application is far from what most people assume that BOTOX® Cosmetic actually addresses. Botulinum toxin injections can be used to treat a wide range of conditions and maladies, from migraines to excessive sweating. You may not agree with others who herald Botox as a “wonder drug,” but you are wise to explore the full range of applications to see if it might benefit you. Botox weakens the muscles that control squinting and other facial expressions, which in turn reduces or eliminates wrinkles and the ‘crow’s feet’ that form around the eyes. It’s important to note that the injections affect only the muscles, not the nerves, so patients experience no loss of sensation around the eye area. Horizontal wrinkles tend to form along the forehead as people age, and Botox injections can erase these creases and leave behind smoother skin. Stubborn furrows that settle between the eyes are no match for Botox injections. Botox injections have proven to be so effective at eliminating brow lines that many people undergo this treatment in place of a brow lift. Most recently, Botox has been used to shrink the masseter muscles, which are the jaw muscles that control chewing. Injections in this area can gently reshape a square-shaped face into a softer, oval shape. Whether you are a teeth grinder, diagnosed with TMD or suffer from jaw tension, Botox injections may be able to relieve your headaches and other jaw pain. After an injection, most patients see relief within a week if not sooner in the day or two following treatment. There is no doubt Botox has become more commonplace in the last 20 years, but it should always be administered by a certified medical professional who can screen you carefully for any potential health risks. Place your trust in Desert Breeze Dental, currently offering a 20% discount on Botox treatments until November 30, 2017. Call 702-869-0032 to take advantage of this limited time offer and to schedule a consultation to see whether Botox can, in fact, do wonders for you. Teeth and mouth injuries are common in sports players all year round, regardless of what sport you play. Your Las Vegas dentist, Dr. Paul VreNon at Desert Breeze Dental can create a custom-made mouth guard that protects the teeth from trauma and injuries that can occur while participating in a variety of sports activities. Why Should I Invest in a Dentist Prescribed Custom-made Mouth Guard? According to the National Institute of Health, the face is often the most exposed part of the body during sporting endeavors. A mouth guard protects the teeth and limits the risk of damage from traumatic impact and unconscious grinding. A mouth guard also protects the gums and other soft tissues in the mouth from cuts and tears, reduces the chance of TMJ trauma and jaw fractures, and may even reduce the chance of concussion from certain types of impacts. A properly fitted mouth guard can help to avoid costly dental procedures and the added discomfort and inconvenience of having to undergo extensive treatment. Mouth guards that are available for over-the-counter purchase will provide slight protection, but will not provide the same level of protection or customized fit of custom-made mouth guard. 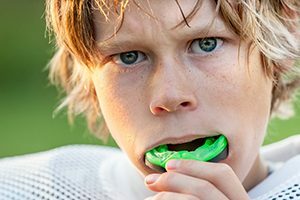 Boil-and-bite mouth guards are softened in boiling water and then molded to the mouth, but the internal layer can easily thin out, which can then lead to inadequate protection. Stock mouth guards are ready-to-wear but can easily become loose and oftentimes pop out. Both types of mouth guards are also more bulky and less comfortable than custom-fitted models. Your Las Vegas dentist and team at Desert Breeze Dental will take custom impressions that fit your teeth and mouth precisely in order to create a durable, comfortable mouth guard to provide optimal protection. You can also express pride for your favorite sports team and/or alma mater by getting a mouth guard to match your favorite team’s colors! Protecting your mouth and jaw with a custom-fitted sports mouth guard is well worth the expense when compared to other costly protective athletic gear. If you’re playing football, would you forgo wearing a helmet? Of course not. Protecting your whole body, including your mouth, is essential to staying healthy and injury-free. From November 1 – 30, 2017, all custom-made sports mouth guards are only $350, a savings of $175, at Desert Breeze Dental. Schedule a consultation with your Las Vegas dentist at Desert Breeze Dental by calling 702-869-0032 to get started!